Print contains two photographic images. One is of Old Fort Garry while the other is of Lower Fort Garry. Photograph shows Boy with the Boot sculpture partially submerged by snow in the International Goodwill Garden at Assiniboine Park. Date of photograph is approximate, [ca. 1960]. Photograph shows the Commonwealth War Graves area of Brookside Cemetery. Photograph shows Cenotaph located on grounds of Manitoba Legislative Building with view looking towards Hudson's Bay Company department store. Date of photograph is approximate, ca. 1930. Date of postcard is unknown. Photograph shows unveiling of Volunteer Monument (or Soldiers Monument) on September 28, 1886. 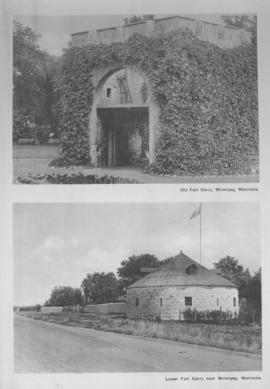 Photograph shows Winnipeg's second City Hall (1886-1962) and Volunteer Monument (or Soldiers Monument). Date of photograph is approximate, ca. 1940. Photograph shows the then new International Airport Terminal, the St. Boniface Cathedral prior to the 1968 fire, the University of Manitoba and the Fort Garry Gate.